Does your organization need to track how much money you’re making and spending? 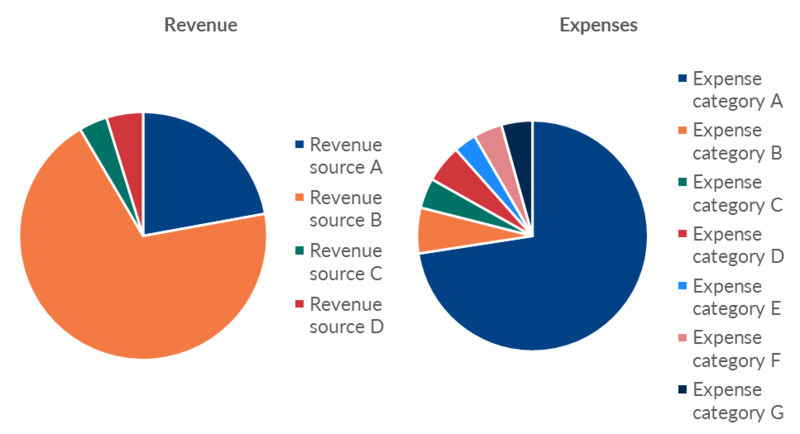 I see way too many Revenue and Expenses numbers gathering dust in hard-to-read pie charts. 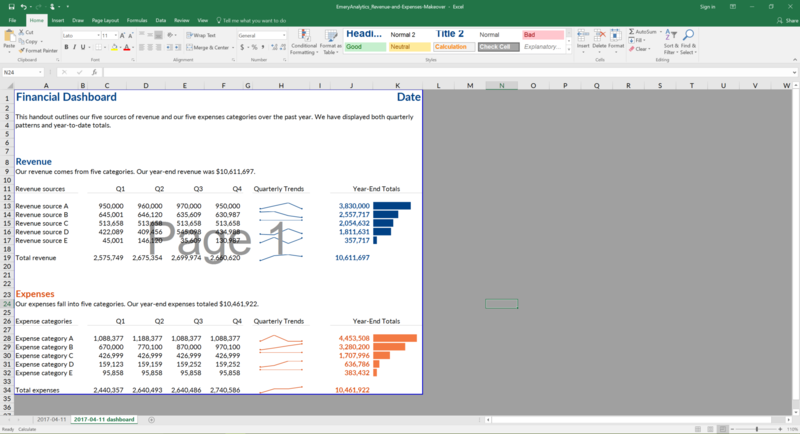 In this blog post, you’ll see how transforming your pie charts into a dashboard–built in good ol’ Microsoft Excel–can be more useful for your organization’s leaders. A couple weeks ago I was in Birmingham with the Alabama Power Company’s grantees. We spent two days learning data visualization principles and producing makeovers of their graphs. One of the grantees was presenting their revenue and expenses data like this, in two pie charts. I changed their numbers and categories in this anonymized version, but revenue included things like grants from foundations and expenses included things like payroll. I’m not anti-pie but I do have a long list of pie chart guidelines. pie charts are only useful for showing a single snapshot in time (this group needed to compare quarterly spending, and pies can’t show trends over time). Let’s look at three data visualization makeovers. They get a little better each time. At the very least, we need to convert the pies into bars. It’s easier for our brains to compare the lengths of bars than to compare the slices/angles/area of pies. Yes, we could get fancy by making the expenses bars go towards the left since those are technically negative numbers. I try to anticipate what types of mental math the viewers will be doing. The organization’s leaders and Board members will probably need to know the total revenue and total expenses. Rather than making those viewers do mental math or tally the numbers in the margins of their handout, I inserted text boxes with the totals. The pie charts and bar charts above were only giving the viewers a single snapshot in time. To manage effectively, leaders need to monitor trends over time. Imagine what this Board meeting would look like: the attendees have a handout about the fourth quarter’s revenue and expenses. Seeing the fourth quarter’s numbers is great, but what about the third quarter? Did we spend more, less, or about the same as the prior quarter? The attendees would have to search through the stack of papers in their folders to find the prior quarter’s handout, place the two pages next to each other on the table, and then zig-zag their eyes back and forth across the table and try to make comparisons. Viewers should never have to lay two pages beside each other or scroll through documents to make comparisons. That’s your job as the designer: to anticipate what they need to compare — quarterly spending — and place those comparisons as close as physically possible. 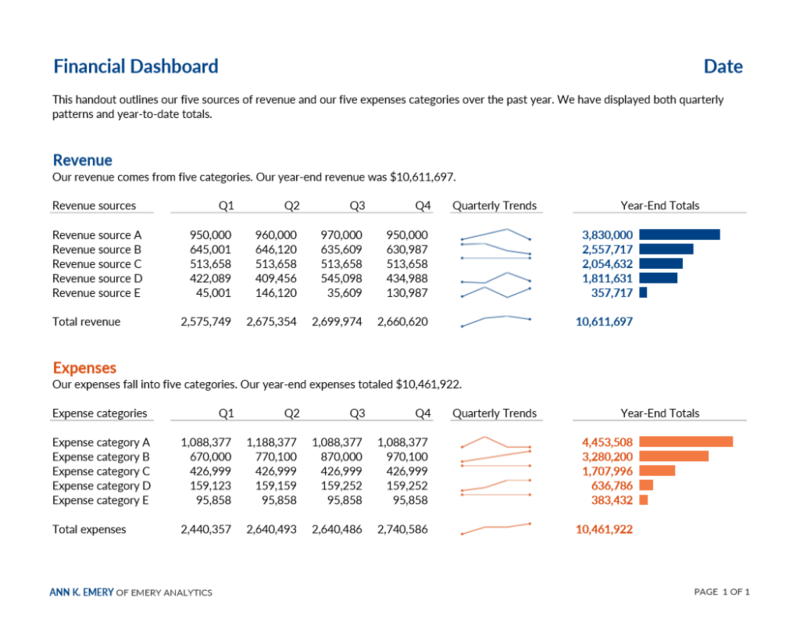 I designed a one-page dashboard that did just that — placed the quarterly numbers directly beside each other to make comparisons natural and easy. I visualized quarterly patterns with spark lines so that viewers could generally see whether numbers were going up, going down, or holding steady over the course of the year. Then, I anticipated that viewers would need to know the year-end totals for each of the categories. Viewers should never have to do mental math; you should do the math for them. I visualized the year-end totals with data bars. Yes, we could’ve gotten fancy and made the expenses bars go towards the left to reflect that expenses are negative numbers. And yes, we could’ve added a row at the bottom that calculated the difference between each quarter’s revenue and expenses to see whether we were cash-flow positive. This group’s priority was monitoring how things changed over time, so the design reflects that priority. Quite an improvement over the pie charts, don’t you agree? Want to design your own revenue and expenses dashboard? Purchase the templates, register for a Dashboard Design online course or webinar; bring me in for an in-person workshop; or borrow my brain during a coaching session. Leaders have more important things to do than read Dusty Shelf Reports. Design dashboards that inform, inspire, and look great in just 12 weeks. Spring 2019.